On July 1, roads and paths on the University of Washington campus will be lined with thousands of people cheering, applauding and high-fiving athletes as they wind their way from residence halls to Husky Stadium. These won’t be Husky football or basketball players, however. Instead, they will be the approximately 3,000 athletes competing in the 2018 Special Olympics USA Games. 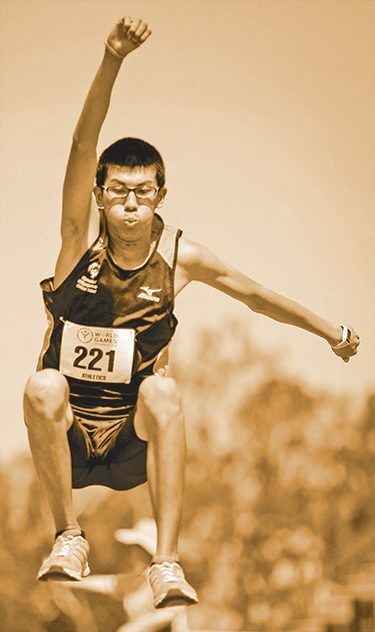 “These athletes will be walking down that gantlet, with everyone cheering and making them feel good about themselves,’’ says Special Olympics volunteer recruiter Paul Strohmeier, ’77. This year marks the 50th anniversary of the USA Special Olympics. And for only the fourth time in the organization’s history, Special Olympics will hold its national games from July 2-6 with competitions ranging from gymnastics and track to flag football and standup paddle-boarding. Half of the 14 events will be at the UW—Meany Hall will be the weight-lifting venue!—with the other half taking place at sites such as Willows Run Golf Club in Redmond, Seattle University, Celebration Park in Federal Way and Angle Lake in the city of SeaTac. Gov. Jay Inslee, ’73, will speak at the July 1 opening ceremony at Husky Stadium while musicians including Ann Wilson from the band Heart, Allen Stone, the hip-hop dance group Massive Monkees, and a chorus of 2,018 singers will perform. There also will be the lighting of the Special Olympics cauldron with the flame having been carried to the stadium by several Special Olympics athletes and law enforcement officials. Among the ambassadors for the Games are such alumni as Kate Deines, ’12 (soccer); Brock Huard, ’99 (football); Damon Huard, ’95 (football); Rob Munn, ’12 (rowing); Chuck Nelson, ’82 (football); Courtney Thompson, ’08 (volleyball); and Izaic Yorks, ’16 (track). This likely will be the most notable sporting event at the UW and the Puget Sound region as a whole since the 1990 Goodwill Games, when Husky Stadium was the site for the track and field events plus the opening ceremonies, with both President Ronald Reagan and Arnold Schwarzenegger speaking. More than 2,300 athletes (including Carl Lewis) from 54 countries were on hand, too. These Games will draw even more athletes, though just from the United States. They will be representing every state in the country. And they will be generating good will. The Special Olympics got their start in 1968 from efforts by the late Eunice Kennedy Shriver to help people with intellectual disabilities. While her brothers John, Robert and Ted Kennedy reached the White House and Senate, her sister, Rosemary, had intellectual issues and was institutionalized for most of her life. Kennedy Shriver’s drive to give people with intellectual disabilities the same opportunities and experiences as everyone else, using sports as a common ground, led to her founding Special Olympics. The youngest athlete at these Games will be 9-year-old gymnast Frannie Ronan from Washington while the oldest is 74-year-old Shebbie Eubanks from Arkansas. Joining the more than 10,000 volunteers supporting the USA Games will be approximately 1,200 UW volunteers who will be aiding the athletes in many ways. Jim Caple, ’97, is a freelancer writer for Columns Magazine. He formerly worked for ESPN.com and the Seattle Post-Intelligencer.